Summary: Summary: At Westish College, a small school on the shore of Lake Michigan, baseball star Henry Skrimshander seems destined for big league stardom. But when a routine throw goes disastrously off course, the fates of five people are upended. Henry's fight against self-doubt threatens to ruin his future. College president Guert Affenlight, a longtime bachelor, has fallen unexpectedly and helplessly in love. Owen Dunne, Henry's gay roommate and teammate, becomes caught up in a dangerous affair. Mike Schwartz, the Harpooners' team captain and Henry's best friend, realizes he has guided Henry's career at the expense of his own. And Pella Affenlight, Guert's daughter, returns to Westish after escaping an ill-fated marriage, determined to start a new life. A few months ago, I couldn't stop raving about THE ART OF FIELDING by Chad Harbach. I loved this book! I even found myself telling everyone it was one of my favorite books of 2011. Not only did it entertain me, but it also gave me a lot to think about. You can read more about my excitement here. And Téa Obreht, author of THE TIGER'S WIFE, calls THE ART OF FIELDING "an intricate, poised, tingling debut. Harbach's muscular prose breathes new life into the American past-time, recasts the personal worlds that orbit around it, and leaves you longing, lingering, and a baseball convert long after the last page." It probably won't come as any surprise to you, but I think THE ART OF FIELDING is the perfect book club selection. There is a very good reading guide available which delves into so many of the issues that I wanted to discuss after reading this novel. Some of the themes include family, expectations, pressure, friendship, teamwork, romantic relationships, change, love, commitment, monomania, perfections, sacrifice, and competition. 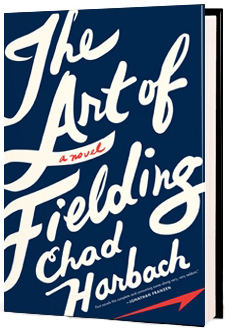 If you’d like to know more about THE ART OF FIELDING and Chad Harbach, you can check out Facebook.com/TheArtofFielding or read a digital excerpt. Thanks to the fine folks at Hachette, I am excited to be participating in a wonderful giveaway opportunity. Ten blogs are hosting a Book Club Booster where you can win up to 10 copies of THE ART OF FIELDING for your book club. And it gets even better! One of the winning groups will get a chance to Skype (or get a call-in) with the author, Chad Harbach. The winner will be chosen through a random digital draw and contacted by the publisher to set up the meeting. Can I tell you how jealous I am of this opportunity? I briefly spoke with Mr. Harbach at last year's BEA and I was fascinated by what he had to say about his novel. I can only imagine how fun a chat with him might be. To enter the Book Club Booster giveaway, just fill out the form below February 6th at 11:50 p.m. ET. I will randomly select and notify the winner the following day. This contest is open to those of you with U.S. addresses only. Good luck! Wow, what a fabulous giveaway! Thanks so much for hosting it! I've actually been trying to talk my book club into this one! Thanks for the awesome giveaway Julie...I'm sure my group would love this one! No need to enter me because I'll be participating as well...so feel free to spread the word to your book club readers. That's an awesome giveaway - would love to surprise my book club - thanks for hosting!